Noyo Harbor: 39°25'40" N, 23°48'20" W, is located 130 nautical miles NW of San Francisco and 145 nautical miles SSW of Crescent City, built near the mouth of the Noyo River. 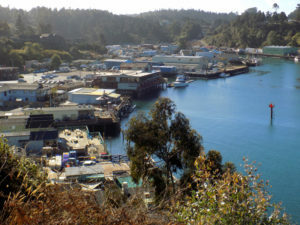 The Noyo Harbor District is governed by five commissioners; the Marina is operated by a Harbormaster and a small staff year around. If you're traveling here from out-of-town, or if you're a local Fort Bragg resident, the biggest July event to enjoy is the World's Largest Salmon BBQ, which is held annually on the first Saturday in July, in Noyo Harbor. 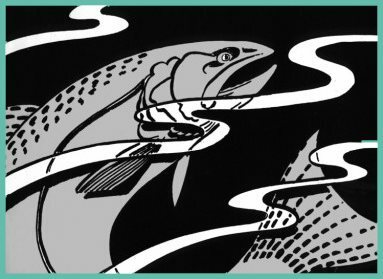 It is put on by the Salmon Restoration Association and all proceeds are used to improve salmon populations on the Northern California coast. A fireworks display over Noyo Bridge follows the bbq, near dark. You won’t want to miss it!! We are currently preparing a Community Sustainability Plan (CSP). A CSP is an assessment of various factors affecting Noyo’s economic, environmental and social well being in the face of an uncertain regulatory climate. This is a long-term, strategic roadmap for Noyo Harbor that will produce recommendations for increased support for our fishing community. Locals and visitor alike appreciate our unique, working waterfront. Preserving the culture of the vital, fishing economy benefits not only our local fishermen, but increases the overall value of Noyo Harbor as an asset for the local Fort Bragg community and visitors alike. For more information, visit our Community Sustainability Plan page.